A RARE RISE UP FLAG, FROM THE BAND’S PERFORMANCE ON JIMMY KIMMEL LIVE, AUTOGRAPHED BY CYPRESS HILL, TOM MORELLO OF RAGE AGAINST THE MACHINE AND JOHN DOLMAYAN OF SYSTEM OF A DOWN. 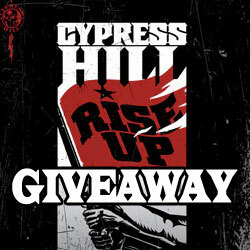 FIVE RUNNERS UP WILL BE SELECTED TO RECEIVE A LTD EDITION RISE UP ARTWORK LITHOGRAPH, SIGNED BY CYPRESS HILL, WITH A COPY OF RISE UP, PLUS A PAIR OF NOISE-ISOLATING “SMOKIN’ BUDS” FROM SKULLCANDY. If you would like to support this Promotion with a banner please log on to our “Link2us” page and grab some banner code.